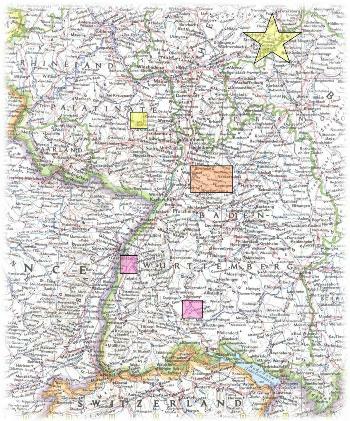 The yellow star on the map shows the vicinity from which the Yagers originally came; the yellow box shows the Falkenstein-Marienthal area where Nicholas Yager settled with his wife before emigrating to America. In orange, we see the area in Baden-Wurttemberg from which the Weavers, Clores, Blankenbakers and Wilhoits emigrated, in Gemmingen, Neuenfeld, Schwaigern, Oberderdingen,and Stetten Am Heuchelberg, villages all very close together. The Hengstelers and Ruops came from the pink areas closer to Switzerland. These were families whose complicated intermarriages eventually linked them to the Yagers in the Second Germanna Colony. 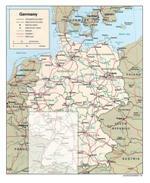 enealogists have traced the Germanna Yager family back to the Hessen province of Germany, and to the villages of Oberzell, Mottgers, and Weichersbach or Meiyersbach in Hessen. These villages are close to the border of Hesse with Bavaria, east of Frankfort, and are also close to the border of the province of Thuringia. Nicholas, we believe, was born in 1676 or 1678, but by the time he was 28 or 30 years old, he had migrated to Falkenstein, Pfalz, where he married, and where he and his wife Anna Maria Siebers lived in a mountain village called Falkenstein below a ruined castle. In 1717 he and Anna Maria, and his son Adam and daughter Anna Maria emigrated to the New World with several other German families to settle in the Second Germanna Colony in Virginia in the New World. We do not know what became of Nicholas' daughter, but the descendants of Adam Yager married the descendants of the other Virginia German colonists for several generations. Because of these intermarriages, there are thousands of the descendants of Nicholas Yager throughout the United States today among Second Colony descendants. They commemorate the courage of their ancestors Nicholas and Anna Maria Yager, and their son Adam, through the organization Germanna Research Group. In addition, there is information on a website maintained by George Durman, Germanna Colonies, and John Blankenbaker, Beyond Germanna. It should be noted right away that many genealogists and sources use the spellings “Yeager” “Yaeger” “Jager” “Jaeger” and “Jeager.” We find that our ancestors were referred to by all these spellings and we can find the same persons on the same page of source material with the surname spelled differently. Therefore, simply to make it easier to compare persons in indices, for example, to see if we have a record of the same James Yager born in a certain year with a certain wife as the James Yager inquiry coming from a correspondent, it is best to pick one spelling, it is best to pick one spelling, and we have chosen Yager for the New World emigrants, for that is how Joan Yager, my great-grandmother, spelled her name.